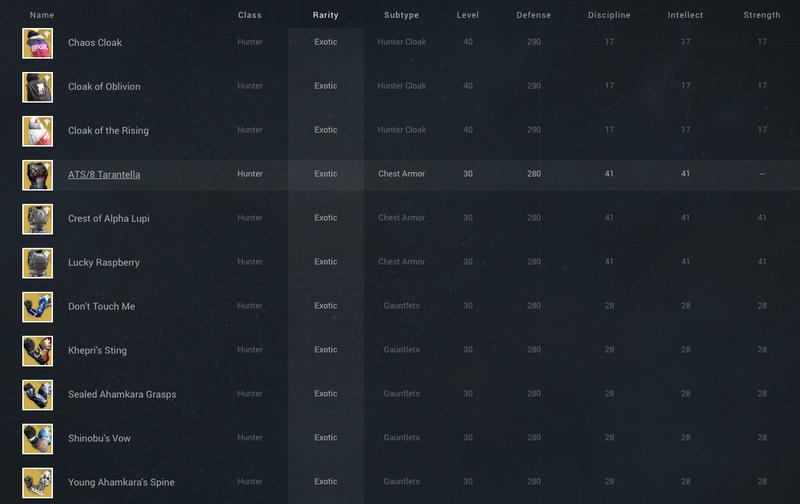 The Destiny: The Taken King exotic list just keeps rolling on with an exotic Hunter helmet Graviton Forfeit. There are many great Hunter exotics, but I picked one that specifically deals with the new subclass Nightstalker. Finally, the Hunter get a support oriented subclass revolving around the dark purple energy of the void. If you want to get more details on the rest of the Hunter exotics, and exotics weapons, check out BUNGIE’S Armory, for detailed stats and 3D images of all the new items. Feel free to check out the new exotic Special Weapons, new exotic Heavy Weapons, and new Warlock exotic pieces of armor by following the links to past articles. The Graviton Forfeit helmet is not the only new Hunter exotic. Let’s take a look at some of the other new items coming in update 2.0.1. Just like the Warlock gear that we looked at yesterday, the Hunter has 9 new Exotic pieces of gear that we can look forward to collecting. However, 3 of those new pieces are exotic class items that can only be obtained by grinding factions to level 25 and then completing a quest. In any case those pieces of gear can be worn in addition to other pieces of exotics, so you might as well swear allegiance to a faction now. We also have 12 returning pieces of exotic gear to look forward to using again. For now let’s focus on the Graviton Forfeit. The highlight of the primary perks for the Graviton Forfeit is the Elusive Shadow. Like many of you I am not sure about the final make up of the Nightstalker class. We do know that the Hunter will receive a Shadestep move, that they can activate during their super which lets them dodge incoming attacks. The Graviton Forfeit will unlock this subclass node for free so that you can choose another node to boost your subclass power. Many of the Year 1 exotics had this feature, such as Helm of Inmost light unlocking Death from Above for the Titan Striker subclass. 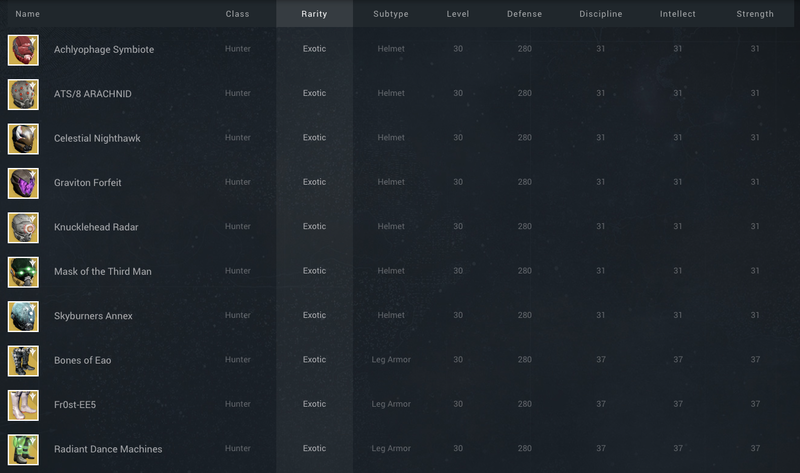 We also see the return of Random Perk selection, so be sure to reforge the armor to your liking. I would recommend Better Already or Infusion, just incase we see another raid mechanic like the no health recovery in Crota’s End. Finally the Selectable Perks for Graviton Forfeit seem very average. Inverse Shadow has always been a standout pick, but it remains to be seen how much bonus Super energy Ashes to Assets and Hands-On will grant. 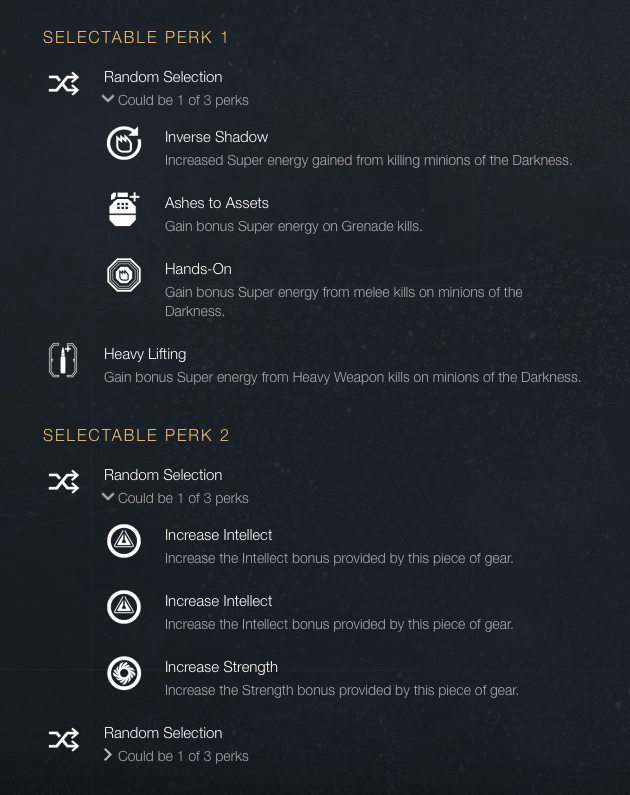 The Selectable Perk 2 doubles the chances for Intellect, with one chance at Strength. The second hidden selection includes Increase Intellect, Increase Discipline, and Increase Strength. We can expect multiple reforges on this helmet to get the right stats. Finally the look of Graviton Forfeit is exquisite. Reflecting the new Void subclass we see a purple void ball covering the face. Hopefully this helmet is animated and adds some special effects while moving around. 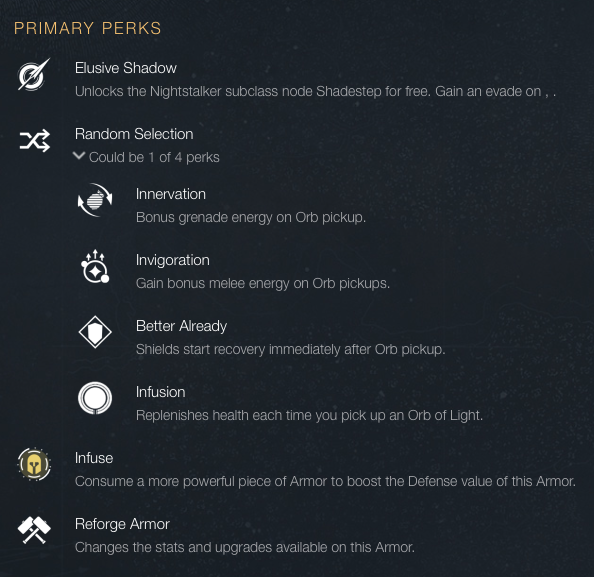 Will you be using the Nightstalker subclass? or will this subclass switch you over to the Hunter’s side? Tomorrow, for the final peak at the Taken King exotics before the launch of the expansion, we look at the Titan’s new exotic chest piece.